Here are a few of my favourite juicer pulp recipes. 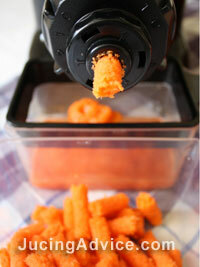 These really are a great way to make use of your juicer pulp. As I have mentioned before the juicer pulp contains a lot of fibre, which is an essential part of a healthy diet. So by following the juicer pulp recipes below you can incorporate that fibre into your daily diet. Preheat your oven to 180 C /350 F.
Mix together the carrots and pineapple pulp. Separate the egg whites and add to the pulp. Fold in the honey, vanilla and oil to the mix. Sift the flour, baking soda, cinnamon and nutmeg together and add it gradually to mixture, stirring until it’s blended. Mix in the nuts. Pour the muffin mixture into greased muffin cups making sure to leave some room for expansion. Bake for approx 45 minutes depending on your oven. Juicer pulp recipes can easily be adapted to contain different pulp flavours try using apple pulp instead of carrot in this muffin recipe. Have Fun and Get the Children Involved! This is a great juicer pulp recipe to get the kids involved in. Cookies and cakes are easy things for children who are learning to bake. You can also have lots of fun with different shaped cookie cutters for all sorts of occasions. Preheat your oven to 200 C /400 F oven. 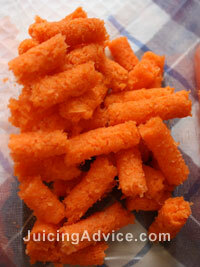 Place the carrot pulp in a small saucepan and add the water, cook over a very low heat for 10 minutes. Stir frequently to stop the pulp from sticking to the bottom of the pan. Mix the oil and honey together in a bowl, then add the beaten egg. Stir in the cooked carrot pulp, flour and baking powder. Finally stir in the vanilla and lemon extracts. Spoon the dough out onto a greased baking sheet. Bake 12 to 15 minutes. This recipe also works really well with apple pulp. You can make savoury things like bread, here is a juicer pulp recipe for carrot bread, which makes a perfect accompaniment to homemade soup. Preheat your oven to 180 C /350 F oven. Mix together the oil and honey, add the eggs. Stir in the carrot pulp. Add all the remaining ingredients in the order listed above and mix well. Pour the bread mix into a greased loaf tin (measuring approximately 8-1/2 inches X 4-1/2 inches X 2-5/8 inches). Bake for 60 to 65 minutes. All of these juicer pulp recipes are pretty easy and what better way to use your juicers waste product. It’s far too healthy and useful to just throw in the bin. See more free recipe ideas on our main page for juicing recipes.